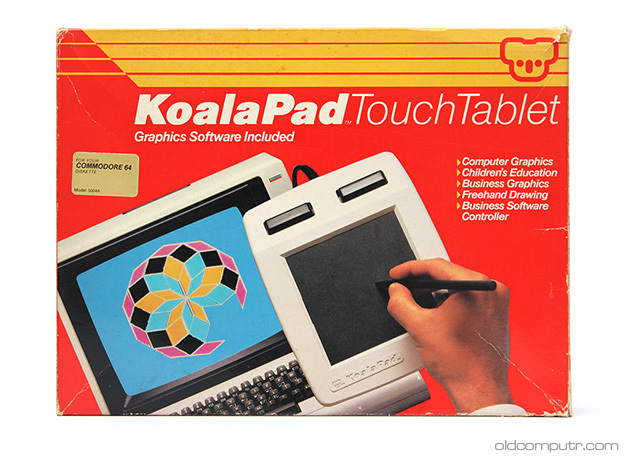 In the mid Eighties I had a Commodore 128 and I sometimes used KoalaPainter – the program that accompained the KoalaPad – with a joystick. Now, 30 years later, I can finally paint with the graphic tablet. 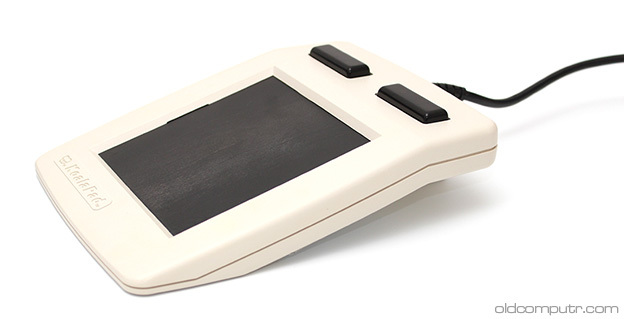 The application is easy to use: you can draw simple shapes (lines, circles, rectangles), paint freehand, or zoom a portion of the screen and draw one pixel at a time. The pictures on the box, like the majority of the images on the net, are frontal: the profile of the tablet is less bulky than it seems. 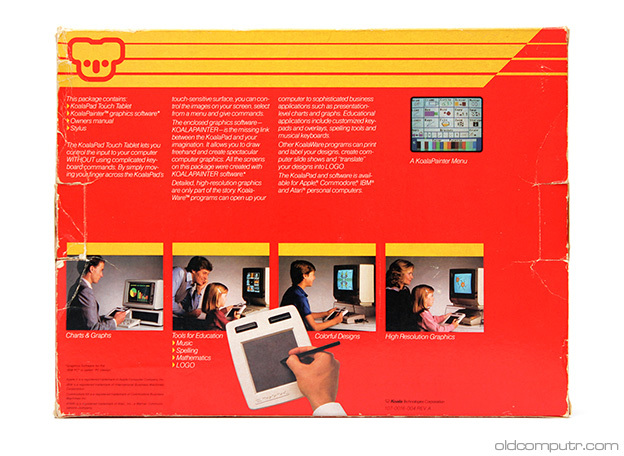 The back of the box presents the product …: a business man in front of a PC (“Charts and Graphs”), then boys and girls of all ages. 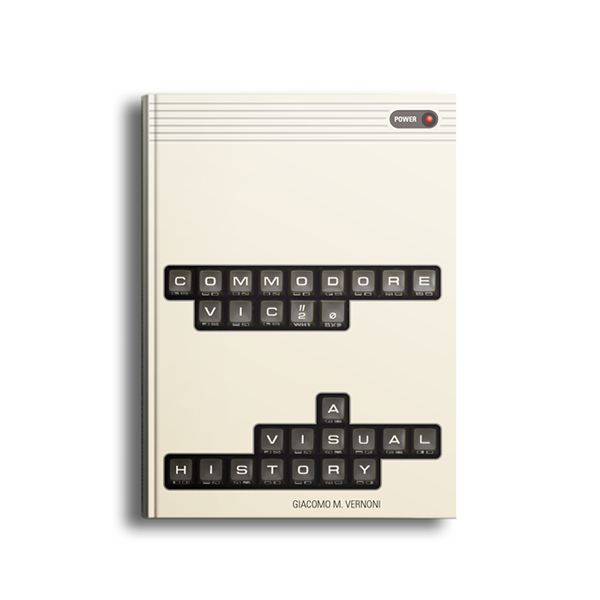 “Tools for Education” with an Apple II, “Colorful Designs” with a Commodore 64, “High Resolution Graphics” with an Atari 800. The construction is very simple: disassembling the TouchTablet was easy and quick. 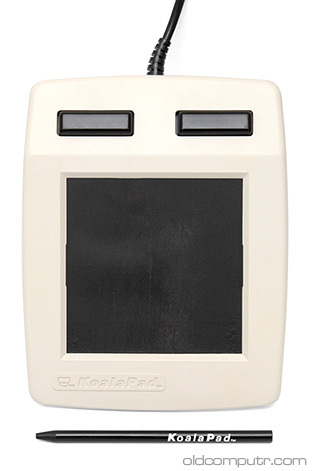 The KoalaPad connects to joystick port 1 of the Commodore 64; the cable ends at the connectors to the right of the picture. The company logo and product name are clearly visible on the top case. Even if there’s the KoalaPainter floppy, for convenience I tried to load the program from my Ultimate 1541 II, but all the versions I found on the net worked with the joystick only; I had to connect a real drive and load it from the original disk. I made a disk image in .g64 format: there’s a copy protection that the simpler .d64 doesn’t support (when the program is loaded the drive seeks a track that probably has a specific error). 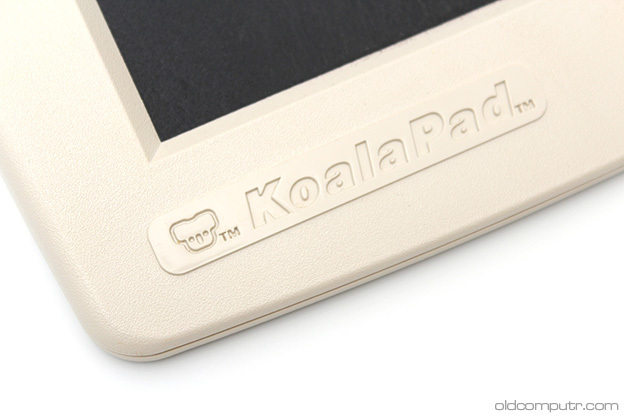 Download the original version of KoalaPainter for the KoalaPad TouchTablet. Read more about the KoalaPad on Wikipedia. 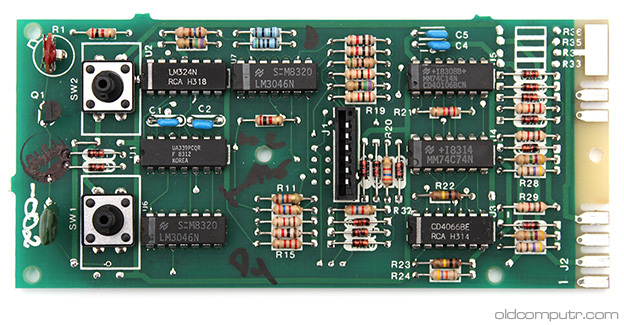 This entry was posted in KoalaPad TouchTablet and tagged 1984, download, ebay on March 4, 2015 by Giacomo Vernoni.